2016 Tohatsu MFS40AETL Get free shipping within the continental U.S. on all In Stock Tohatsu Tiller Handle 4-stroke portables, 20HP and below. Call today to purchase your new portable Tohatsu outboard and we will ship it out the same day free! Call to Order Portable Tohatsu Outboards. Large Tohatsu outboard motors (25HP and above) must be rigged by a certified Tohatsu dealer. 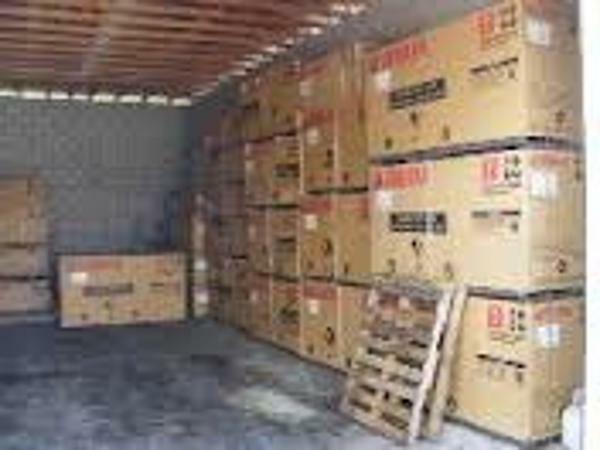 We offer free pick-up and delivery for all of our customers in the Central Florida region, and we offer competitive pricing on installation. Call to Order Large Tohatsu Outboards. 2016 Tohatsu MD40B2ETOS Get free shipping within the continental U.S. on all In Stock Tohatsu Tiller Handle 4-stroke portables, 20HP and below. Call today to purchase your new portable Tohatsu outboard and we will ship it out the same day free! Call to Order Portable Tohatsu Outboards. Large Tohatsu outboard motors (25HP and above) must be rigged by a certified Tohatsu dealer. We offer free pick-up and delivery for all of our customers in the Central Florida region, and we offer competitive pricing on installation. Call to Order Large Tohatsu Outboards. 2016 Tohatsu MD40B2ETOL Get free shipping within the continental U.S. on all In Stock Tohatsu Tiller Handle 4-stroke portables, 20HP and below. Call today to purchase your new portable Tohatsu outboard and we will ship it out the same day free! Call to Order Portable Tohatsu Outboards. Large Tohatsu outboard motors (25HP and above) must be rigged by a certified Tohatsu dealer. We offer free pick-up and delivery for all of our customers in the Central Florida region, and we offer competitive pricing on installation. Call to Order Large Tohatsu Outboards. 2015 Tohatsu MFS40AETL Get free shipping within the continental U.S. on all In Stock Tohatsu Tiller Handle 4-stroke portables, 20HP and below. Call today to purchase your new portable Tohatsu outboard and we will ship it out the same day free! Call 888-389-3648 to Order Portable Tohatsu Outboards. Large Tohatsu outboard motors (25HP and above) must be rigged by a certified Tohatsu dealer. We offer free pick-up and delivery for all of our customers in the Central Florida region, and we offer competitive pricing on installation. 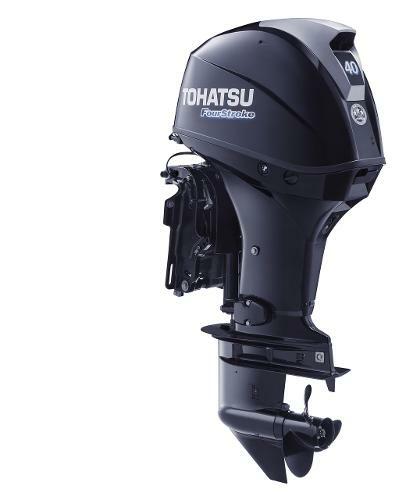 Call 877-412-3408 to Order Large Tohatsu Outboards. 2015 Tohatsu MD40B2ETOS The Tohatsu 40hp TLDI®is one of the smallest engines available with air-assisted direct injection technology. This outboard has all of the benefits of new and improved 21st century technology without compromising power or performance. We have added this new low-pressure air/fuel delivery system to our proven engine block to give you an outboard superior to al others. It provides exceptional fuel savings over 4-Strokes and conventional 2-Strokes alike and is very gentle on the environment. If you're looking for a tiller model, we now offer a multi-function tiller handle as standard equipment. This tiller handle includes all controls conveniently located on the handle for easy access giving you more control, better maneuverability and increased safety. And our 40 hp TLDI®outboard weighs up to 15% less than competitive 4-stroke outboards and meets EPA emission regulation. Get free shipping within the continental U.S. on all In Stock Tohatsu Tiller Handle 4-stroke portables, 20HP and below. Order your Tohatsu outboards today. Please contact us to talk to a member of our Tohatsu outboard motors team. We appreciate your business and look forward to your return. 2015 Tohatsu MD40B2ETOL The Tohatsu 40hp TLDI®is one of the smallest engines available with air-assisted direct injection technology. This outboard has all of the benefits of new and improved 21st century technology without compromising power or performance. We have added this new low-pressure air/fuel delivery system to our proven engine block to give you an outboard superior to al others. It provides exceptional fuel savings over 4-Strokes and conventional 2-Strokes alike and is very gentle on the environment. If you're looking for a tiller model, we now offer a multi-function tiller handle as standard equipment. This tiller handle includes all controls conveniently located on the handle for easy access giving you more control, better maneuverability and increased safety. And our 40 hp TLDI®outboard weighs up to 15% less than competitive 4-stroke outboards and meets EPA emission regulation. Get free shipping within the continental U.S. on all In Stock Tohatsu Tiller Handle 4-stroke portables, 20HP and below. Order your Tohatsu outboards today. Please contact us to talk to a member of our Tohatsu outboard motors team. We appreciate your business and look forward to your return. 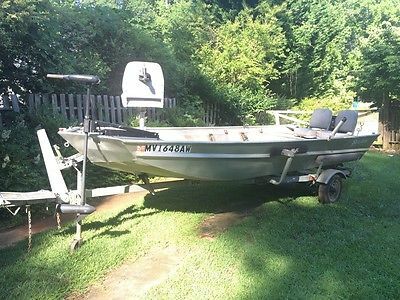 SeaArc 16' Jon Boat, aluminum trailer, 9.9 hp Tohatsu motor. Lots of accesories! Great fishing, duck hunting boat that will get you anywhere. Tons of extras, all in good working order! Trolling Motor, Electric Anchor, Eagle Depth Finder!!! Have to see to believe!Welcome to take it on the river for a test drive.Available in Marietta, GA.The residue that you see on the interior walls is dry glue from when we had the sides carpeted.The wires sticking up in the middle of the floor connect to the battery which is included.We used to have a a center mounted cooler and the battery would sit in it's own case strapped to the floor.GA DNR permit current through 2018. SeaArk 16' aluminum boat. 9.9 Tohatsu 2 Stroke MotorBuilt 1996. 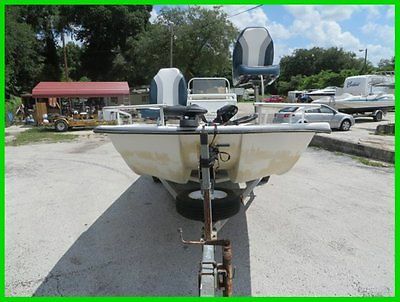 Model: Hook, Line & SeaArkType: Semi-V Length: 15'11" Beam: 5'6.5" Hull: Aluminum Use: Fresh Water Engine Type: Outboard Engine Make: Tohatsu Engine Model: M9.9C Fuel Type: Gasoline For Sale: By Owner Hull ID Number SOMO6408D696Includes---40 LB Thrust Minn Kota Tiller Controlled Trolling Motor New in the box Minn Kota Electric Anchor system.Eagle Depth finder Plenty of rod holders Includes Aluminum Trailer Has Marine Plywood Floor Tie Down Brackets for Cooler,Bait Tank, etc.. Stainless Steel Prop Guard Planing Fins Fully wired for accessories Ready to go fishing! Great fishing, duck hunting boat that will get you anywhere. Tons of extras! Trolling Motor, Electric Anchor, Eagle Depth Finder!!! Available in Marietta, GA. SeaArk 16' aluminum boat. 9.9 Tohatsu 2 Stroke MotorBuilt 1996. Model: Hook, Line & SeaArkType: Semi-V Length: 15'11" Beam: 5'6.5" Hull: Aluminum Use: Fresh Water Engine Type: Outboard Engine Make: Tohatsu Engine Model: M9.9C Fuel Type: Gasoline For Sale: By Owner Hull ID Number SOMO6408D696Includes---40 LB Thrust Minn Kota Tiller Controlled Trolling Motor New in the box Minn Kota Electric Anchor system.Eagle Depth finder Plenty of rod holders Includes Aluminum Trailer Has Marine Plywood Floor Tie Down Brackets for Cooler,Bait Tank, etc.. Stainless Steel Prop Guard Planing Fins Fully wired for accessories Ready to go fishing! 2010 15’ Alweld 1536CJ Jon Boat with a Tohatsu Tohatsu MFS 20CCEPTS 20hp 4-Stroke Motor Jon Boat Is Like New and Motor with less than 20 hours use. Has Electric Start w/12Volt Battery Charging plus Back-Up Thru-Cowl Manual Start, Alternator Included. Gear Shift: Forward-Neutral-Reverse, Tilt and ignition at (Control Box) on right side) and Stick Steer on left side both are controled from the Front Swivel Seat. Trim/Power Tilt On Control Box and on Engine, Power Operated Tilt Angle Range: -6° to 75° Minn Kota Edge 45 lb Thrust Electric Trolling Motor used very little. Hummingbird Fish Finder PMAX143 600’/20 degree/single beam Two Swivel Bucket Seats, Pole Holders, 6 gal Fuel Tank, Life Vests, Fire Extinguisher and Anchor Drive on Galvanized Trailer w/spare Tire Motor has 4 years of a 5 year Year Mfg. Transferable Limited Warranty remaining. Boat is Currently Registered in Tennessee Note: (Tohatsu is the Manufacturer of all Nissan Outboards) Tohatsu also has a relationship with Mercury Marine to manufacture portable outboards offered by Mercury Marine below 40hp. 2017 Yamaha Outboards F40LA Please call us for more info. We are the Space Coasts Repower & Small Outboard Experts. We have tons of engines in stock from 2.5 to 350 hp. We sell and are the certified warranty center for Yamaha, Mercury, Suzuki, Honda, Volvo Penta, Lehr, Tohatsu, Minn Kota Trolling Motors and More. For friendly assistance contact Boaters Exchange and we will give you the best customer service possible. We thank you for your consideration. 2004 Caliber 40LRC SE CAN BE VIEWED AT THE ST. PETERSBURG, FLORIDA BOAT SHOW, DECEMBER 3-6, 2015, IN-WATER SLIP 849. 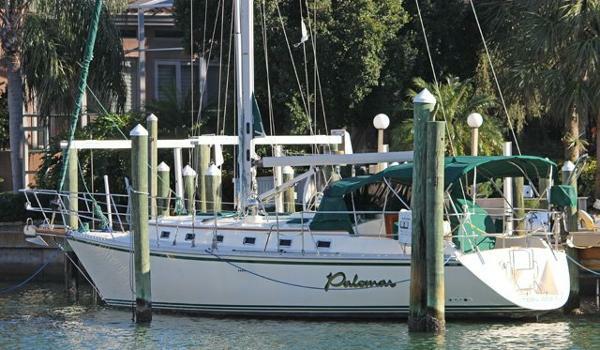 56 HP Yanmar Diesel Engine W/212 Gallon Fuel Tank For Long Range Cruising Palomar is a absolutely pristine one owner boat bought new at the Annapolis boat show in 2004! 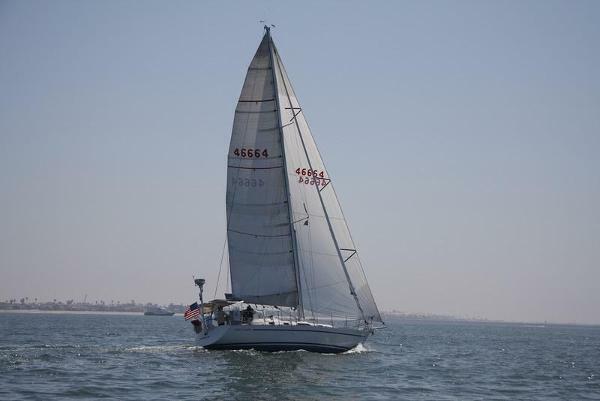 This is a beautiful example of a boat that was meticulously designed by her builders for long range cruising and safety. The 40LRC has redundant systems and many features built into the hull to ensure a safe passage in the worst of conditions. She is loaded with options including a Seldon roller furling mast, reverse cycle ac/heat, two staterooms & two heads, beautiful teak interior, full galley, Garmin 545 gps/plotter, Raymarine ST6001 autopilot, Raymarine ST60 Wind, Raymarine ST60 Tridata depth/speed/log, Ritchie compass, Standard Horizon VHF, Poly-Planar marine cd/stereo w/cockpit & salon speakers, Poly-Planar cd changer, plus much more! Also included in sale is a 10' Mercury inflatable dingy w/5hp Tohatsu engine. If you are in the market for a truly turn-key boat that can take you anywhere, this 40LRC is a must see!! 2016 Yamaha Outboards F40LA Please call us for more info. We are the Space Coasts Repower & Small Outboard Experts. We have tons of engines in stock from 2.5 to 350 hp. We sell and are the certified warranty center for Yamaha, Mercury, Suzuki, Honda, Volvo Penta, Lehr, Tohatsu, Minn Kota Trolling Motors and More. For friendly assistance contact Boaters Exchange and we will give you the best customer service possible. We thank you for your consideration.